Our 4 year old program is one of a kind, it is state-funded and rooted in Christian beliefs. We save the last half hour of every school day to learn about Jesus through Bible stories, chapel time, songs and prayers from the heart. We use Creative Curriculum for Preschool that provides children with opportunities to learn and practice newly gained skills. It also offers challenges just beyond the level of their present mastery and it takes place in the environment of a community where children are safe and valued, where their physical needs are met, and where they feel secure. Incorporated is new information about the content in literacy, math, science, social studies, the arts, and technology that preschool children can and will learn here at AGC. The Curriculum is shown in ways that support children's academic progress while respecting the way they grow and develop. The subject areas are organized into interest areas; Blocks, Dramatic Play, Toys and Games, Art, Library, Discovery, Sand and Water, Music and Movement, Cooking, Computers, and the Outdoors. Our teachers use these interest areas and objectives, made by the Creative Curriculum, to observe each child's development and to create goals for their students. The goals and objectives are based on four areas; Social/ Emotional Development, Physical Development, Cognitive Development and Language Development. Parents will be informed on how their child is doing with two Parent Conferences, one in the Fall and another in the Spring. There are two scheduled field trips throughout the year, one in the fall and one in the spring. Previous years we have been to the Swisher Apple Orchard, an AGC Family's Farm and Bloomsbury Farm. Parents are encouraged to come by completing provided paperwork prior to the field trip. Students and parents, if they wish, will ride on a bus with a bus driver provided by College Community School District to and from the destination. The children absolutely love this being that it may be their first time on a bus and sharing it with a parent. We have three classes of 4 year old preschool. A class of 19 in the morning from 8:30 to 11:30 and two classes, one has 19 students and the other has 16, in the afternoon from 12:30 to 3:30. Preschool is Monday through Thursday starting August 29th and going until May 19th. A snack schedule is emailed to parents every month. Parents are asked to provide nutritious snacks for the class about four to five times during the year. Snack days will be assigned by the teachers and posted on the monthly calendar outside the classroom door. A snack bag is given to the child the day before snack is brought. A child feels proud when it is their turn to take the bag home and fill it. During a child's birthday, the child will be assigned to bring treats on or near his/her birthday. It is not necessary to follow the Department of Human Services Guidelines (see handbook) on the this day but snacks do need to be prepackaged. Birthdays are a great day for a parent or grandparent to visit! To apply for enrollment, go to our Enrollment tab and fill out the form. The AGC office will be with you in next couple of days. All Tuition is State-Funded. There is a deposit fee to hold your child's spot and will be refunded in the Fall. The fee can be paid either by EFT or check. There is a $20.00 Non-Sufficient Funds return fee. IF for any reason you are in need of special payment arrangements, please discuss your needs with the Director. We believe that we have created a wonderful place where your child can feel safe and special every time they walk through the door, but we also understand the need for affordable education and childcare for today's growing families. 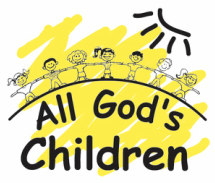 For more in depth information on All God's Children's 4 year old program, see our Handbook.